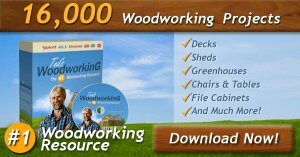 Free plans and step by step instructions to build a sawhorse. Click here for detailed wood sawhorse plans PAGE 1. Click here for detailed project plans PAGE 2. These sawhorses are to lay stock on for marking and sawing, to put large work together on, and are convenient for various uses (Fig, 105). The proper height for your sawhorses, as for the bench, depends somewhat on your own height, and may be anywhere from 18" to 2' 3". Experiment with boxes to find the most convenient height. If too low, you will have to stoop over too much. If too high,it will be awkward to rest your knee on a board, to saw, and to fit work together. 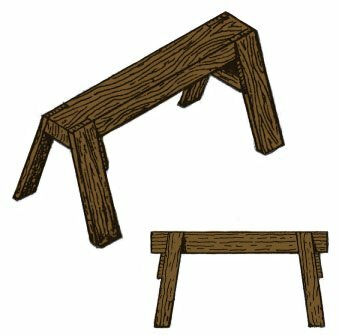 If you have a piece of fairly good joist, from 1 ½" x 3" to 3" X 6", you can use it for the tops of your horses. Saw off two pieces from 2' to 3' long. Mark the best sides for the top. Mark each end like Fig. 106 (showing top and bottom) with the pencil, measuring carefully so that the bevel or slant will be the same for both legs. Holding the work in the vise, with saw alone or saw and chisel remove the pieces marked, so that the end will have the shape shown in Fig. 107. If you use the chisel, look out for the direction of the grain at each corner and cut well outside of the line, until you find which way to push the tool in each case. Trim these cuts as accurately to the lines as you can. Get out eight pieces for legs, of such a length that the horses will be of the height decided on. First make them all of a width, then saw one piece off the right length and mark the others by it---not each new piece by the one last marked. Nail or screw these legs in place with 2" nails or 1 ¾" screws, keeping the inner edges of the tops of the legs even with the tops of the horses (Fig. 108). Look out for splitting. Get out the cross-braces of board and saw the ends at a bevel to correspond with the slant intended for the legs. See that the ends of these cross-braces are cut at the same bevel. Use the bevel if you have one. If not, first square each end with the square and pencil, and then measure carefully equal distances on one edge before drawing the slanting lines (Fig. 109). Nail or screw these on (Fig. 110), adjusting the legs to the bevels just cut. Saw or plane off the projecting ends of the legs on top. If you plane, do so both ways to avoid splintering (see Plane). Now stand the horses on their legs (Fig. 111). If they should happen to stand firmly and evenly, see first if it is not due to unevenness of the floor. If the floor is true, and they stand steadily in different positions, you can throw up your caps, for you will have beaten the average workman. Make the tops of the horses as smooth as you can. Scrape them and keep them scraped, for you will be continually dropping glue or varnish on them, to harden and deface your nice, smooth work. Wipe them off as carefully as the bench-top. These easily made sawhorses will answer your purpose for a long time. Fig. 112 shows a nicer pair of sawhorses. Take two pieces of pine, or any wood not likely to warp, 2" x 3" (or 4") x 2 ½' or 3', mark with rule, square, and gauge (see Gauge), and cut with saw and chisel the shallow gains (Fig. 113) for the legs. Make them the same depth at the top as at the bottom (Fig. 114), and clean them out as accurately to the lines as you can. Get out eight legs, and regulate their length as before. Saw the upper ends on a bevel (Fig. 114) corresponding to the slant they are to have. Nail or screw them in place. You can glue the joints for additional strength. Fit on cross-pieces and finish the work as described above. If you ever need sawhorses for very heavy work you can make the legs of plank or joist with the tops cut like Fig. 115.